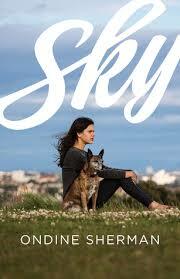 In my book, I wanted to help readers connect to animals by experiencing them through the main character, Sky’s, eyes. The two species I write about are dogs and chickens. Sky is mad about animals but she lived in a small apartment and never had a pet. Her only experience was petting passing dogs on the street. This isn’t unusual; many of us living in big cities don’t have the opportunity to get to know an animal, one-on-one, and form a connection. It was easy to write about the friendship between Sky and the abandoned dog, Bella, she adopts when she moves to the country to live with her aunt and uncle. I know dogs well. They’re celebrated as our ‘best friend’, are natural companions to humans and understand us in many ways, and us, them. We’ve been living side-by-side for tens of thousands of years. However, the vast majority of people have never met a chicken and they seem very foreign and unfamiliar to us. Before I started writing about Sky’s chicken friend, Chirp, I had never met one either. I did a lot of research as I wanted to bring Chirp to life on the page and make the connection between them feel real. I watched documentaries (yes, there are whole movies dedicated to chickens!) and YouTube videos, read books and even found someone who allowed me to come and cuddle her hen. During the research process, along with Sky, I learnt how chickens are complex, feeling, intelligent animals and understood that they’re very under-appreciated. I became so interested in chickens during the writing process that I decided I wanted to create a space in my garden for rescued hens. I watch them dust-bathe, prune, scratch in the earth, sunbake and compete for a pecking-order. They have best friends (Oreo and Nutella are glued together night and day) and invite them to share their food with a high-pitched staccato call. They are very chatty. I bring them treats and some adore bananas, and others rush to the sweet corn. We can’t all have chickens in our backyards, or be-friend one like Sky does. I do hope readers will be able to experience Sky’s connection with Chirp and come to understand that we humans can have a relationship with many animals, even those who we find strange or different. All animals, no matter if they’re feathered, furred or scaled, deserve our respect and compassion. Ondine Sherman is a life-long animal advocate, and is passionate about promoting respect and compassion for all creatures. In 2004, she and her father, Brian Sherman AM, founded Voiceless. The organisation is now one of Australia's leading animal protection groups. Ondine's first book, The Miracle of Love is an intimate account of her experience mothering identical twin boys who were diagnosed with a rare genetic disorder. Ondine grew up in Sydney and currently lives in Tel Aviv with husband and three children. Visit again soon for our review on Sky.